Stylish (and pink!) 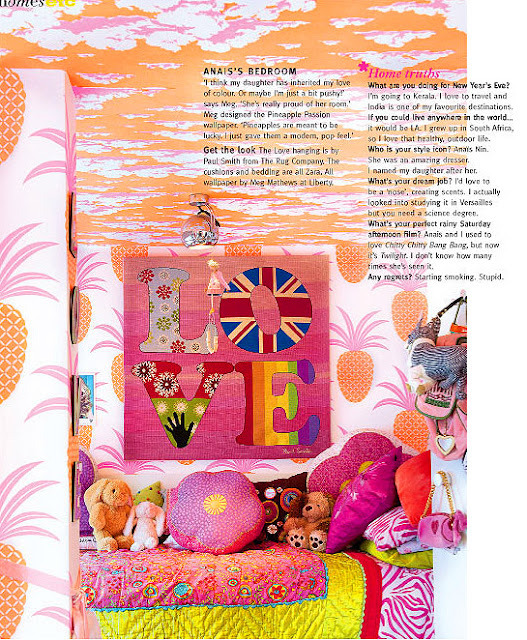 Homes: Meg Matthews "Pop Box"
Despite being fairly pink-ist, I rather love the home of "Wallpaper designer" (and ex-wife of Oasis's Noel Gallagher) Meg Matthews. 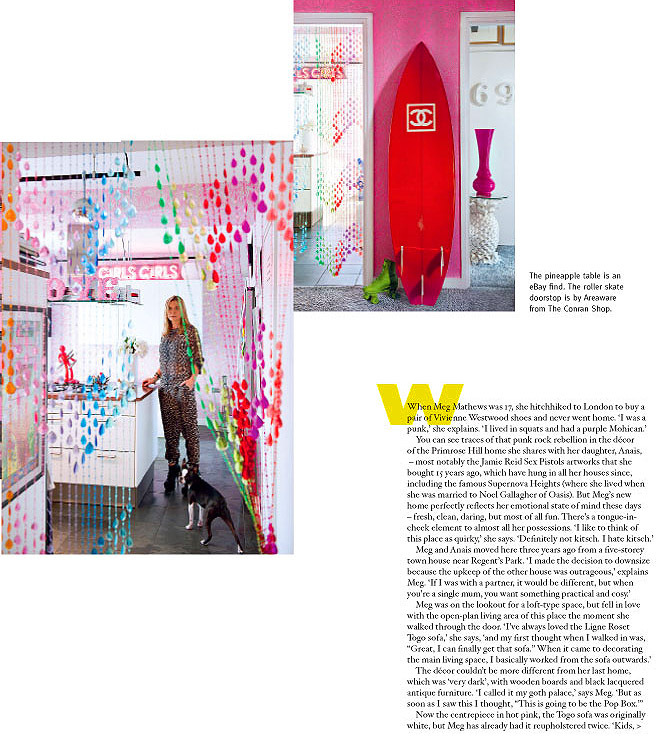 And are you swooning over the Honeysuckle pink Togo lounge?!?! OOOOH I LOVE IT! I would run it past Mr Tonic, but I'm guessing he might divorce me on the spot. PS Found via Bodie & Fou and House Mad. 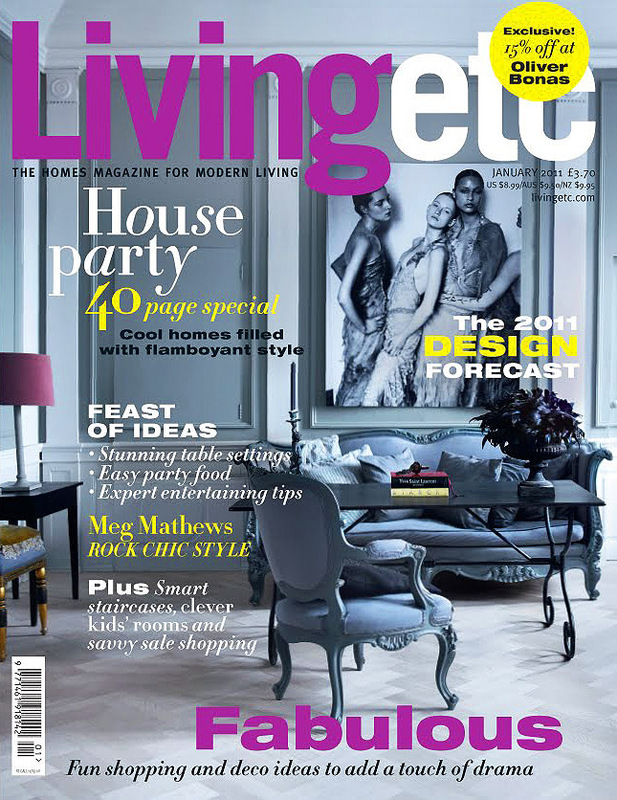 Meg Matthew's home appeared in the January 2011 issue of Living etc magazine. Her wallpaper range is sold exclusively at Liberty in the UK and retails at £89 per meter. "Anais (her daughter with Noel Gallagher), laughing, traveling, freebies, cooking, meeting people, Top Shop, lace, flea markets, room service, sunsets, poker, painted leather, Diptique candles, anything organic, bikinis, early nights, riding, high heels, Agent Provocateur, handbags, my cats, friends, serenity, music, photography, family, all that’s fresh and wild, open fires, football, big sunglasses, vintage clothes, massages, dinner parties, lazy Sunday mornings reading the papers, recycling, water….lots of it, sushi, English breakfasts, the beach, Spirulina, fast cars, road trips, scented things, swimming, Chanel, denim". I can totally appreciate the cool factor of this house...but it would never fly over here with my family. Love all the pop art...especially the ones of the queen. Her boots...sigh...totally amazing. 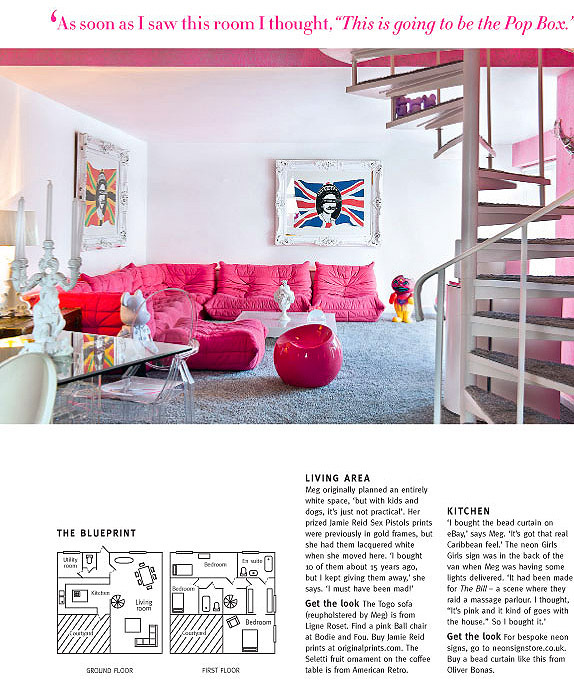 This home is great and fun, love it! Yum. When I rid myself of this gastric bug (hope it hasn't travelled up the coast as far as you), Imma getting my copy of Living Etc. Never been a pink person, and don't like togos but found myself looking for pink a few months ago and now I find myself getting all happy when I see it. WTF? And I'm hoping that's one of her wallpapers on her daughter's ceiling - sunset clouds! Must have me some of that! Too cool! Louise I am going to all of the great links you provided! Hope you have a fabulous week darlin! a bachelorette's dream! if i didn't have to appease my husband, i would live in a place like this!